Panama Canal weather is a major factor in deciding when to take a cruise through this popular Central American destination. The main reason comes down to one word — rain. Panama Canal cruises usually embark from ports on both the western and eastern coasts of the United States. Anyone leaving from an eastern port such as Miami or Fort Lauderdale will typically visit one or two destinations in the Caribbean before entering the canal at Colon, drifting through the countryside to Panama City and then traveling up the western coasts of Central America, Mexico and the U.S. until reaching the end of the journey in places such as San Diego before flying home. People leaving from the west coast of the U.S. will simply do the opposite, although they are more likely to visit extra destinations on the western coasts of Mexico and Central America than anything in the Caribbean. Panama receives widely varying rainfall patterns despite the fact that it is slightly smaller than the state of South Carolina. Panama City historically receives light rainfall from January through April with an average ranging between one and three inches a month, according to the World Weather Organization. Rainfall picks up dramatically in May with the total reaching up to nine inches on average through August. It exceeds 10 inches in September and peaks at 13 inches in October before dropping back to 10 inches in November. It rains an average of 20 days in October. The Caribbean coast of the country is much less predictable with rain exceeding 22 inches in Bocas Del Torro during December — the same month when Panama City averages only four inches. January, March and May have less rainfall on average than other months. 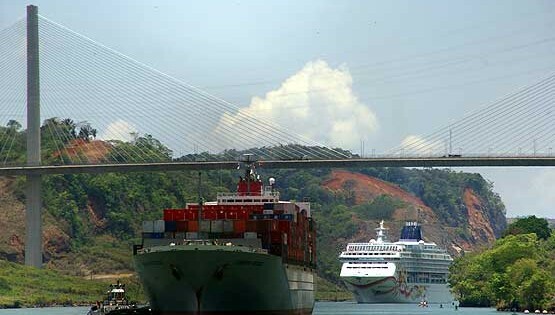 For these reasons, the typical Panama Canal cruise takes place only certain months of the year, such as March. Temperatures are much more predictable. Panama City averages in the low to mid 90s Fahrenheit during the day year round. The average lows are in the mid to upper 60s most months. The east coast is slightly cooler with average highs in the upper 90s and average lows hovering around 70 degrees Fahrenheit. The Panama Canal cruise season usually lasts from October through April. But the best months to go are December and later. A cruise in October or November has a higher chance of heavy rains. Click Panama weather forecasts for 7-day outlooks and current conditions in Panama City and Bocas Del Torro. See Panama climate charts with average monthly rainfall and temperatures.